Myles Vincent Mezzetti and the Mezzetti family under the new entrance sign to the high school gymnasium. The sign was donated in Mary “Mai” Mezzetti’s name. 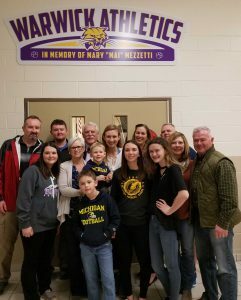 The Warwick Valley School District and the athletic community thank the family of Mary “Mai” Mezzetti for the new entrance sign for the high school gym, a gift to the district made in her memory. Mai’s voice echoed throughout Warwick Valley athletic events, cheering for her daughter Mary and sons James, Chipper, and Mike, all Warwick Wildcats and outstanding student-athletes. Mary, along with her husband of 50 years, Myles Vincent Mezzetti, immigrated from Ireland in 1969. Her grandchildren Zack, Erin, Chelsea, Kaylei, Devon, Mike, Cormac, Mia and Lochlann carry on her passion for Warwick Valley. We thank her family and many donors who gave to the Purple Champions Club, which purchased the entrance sign, and to the Brian Ahearn Children’s Fund. “Mai” Mezzetti’s spirit and her love for Warwick athletics and Warwick Valley schools will not be forgotten.